LEONIDAS TRIPLE DATE CHRONOGRAPH STEEL Leonidas, case No. 398936. Made in the 1940s. 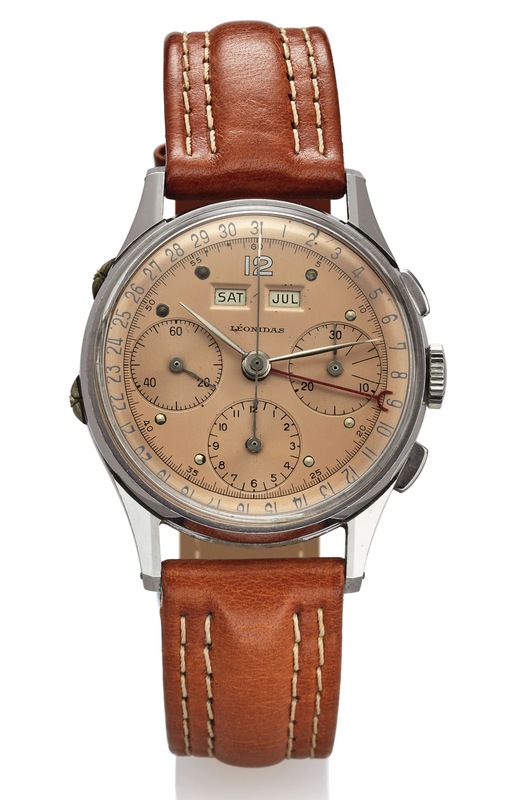 Fine and rare, stainless steel wristwatch with square button chronograph, registers and triple date. Three body, polished and brushed, lapidated lugs, inclined bezel, correctors on the band, snap-on case back. Copper color with round indexes and Arabic 12, outer 1/5th seconds track with 5-second Arabic markers and date and graduation for the days of the month, subsidiary guilloche dials for the seconds, 30-minute and 12-hour registers, apertures for the day of the week and the month. Gold feuille hands. Cal. 13''', rhodium-plated, fausses cotes decoration, straight-line lever escapement, monometallic balance, steel Breguet balance spring. C. Three body, polished and brushed, lapidated lugs, inclined bezel, correctors on the band, snap-on case back. D. Copper color with round indexes and Arabic 12, outer 1/5th seconds track with 5-second Arabic markers and date and graduation for the days of the month, subsidiary guilloche dials for the seconds, 30-minute and 12-hour registers, apertures for the day of the week and the month. Gold feuille hands. M. Cal. 13''', rhodium-plated, fausses cotes decoration, straight-line lever escapement, monometallic balance, steel Breguet balance spring.